Francois Devienne, Flutist, Bassoonist, Composer and Teacher, was born on January 30, 1719 in Joinville, Haute-Marne and died on September 5, 1803 in Paris, France. Devienne played principal Bassoon in the orchestra of the Theatre de Monsieur (later the Theatre Feydeau) in Paris from 1790 to 1801, wrote a celebrated Method for the (one-key) Flute in 1794 and was Professor of Flute at the Paris Conservatory when it was established in 1795. As a composer Devienne wrote 12 Comic Operas, 4 Bassoon Concertos, 2 Horn Concertos and 12 Flute Concertos, in addition to 21 Flute Quartets (for Flute, Violin, Viola & Cello). 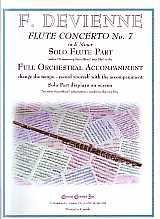 Flute Concerto No. 7 in E Minor was composed in 1787.